For the last couple of months, I have been anxiously following the recovery of a strong little 1 and a half year old named Noah. Baby Noah was born in 2009 with many anatomical birth defects. He underwent his first major surgery at 4 days old, and last November he had his first open heart surgery. At only 16 months old. This is when I began following his recovery and thinking of him often. After an ER visit of our own, I realized how sad these children look in the hospital issue gowns; and it occurred to me that if I hated seeing my own child in one for 4 hours, it must be overwhelmingly more difficult to see your child day in and day out in these things. In my own fashion loving way, I had an idea that I hoped would help lift Noah’s spirits during these extended stays, but also give his mommy some of the joy of dressing up her baby boy. I set out to design a few gowns with flair! I adapted a raglan sleeved jacket pattern so that it was open down the back, and also added a seam along the shoulders to aid in getting it on and off of a bed bound patient easily, using my KAM snap press. Then came the creative part! 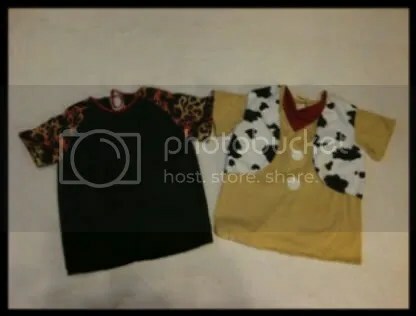 I heard that little Noah was a Woody fan (From Toy Story), so the first gown I created is meant to replicate Woody’s shirt, vest, and hankie. I think it came out well, it was the most time consuming but also the most fun! The other two gowns were much simpler; I used some flame fabric and tough-guy black to create a “Big Boy” gown. 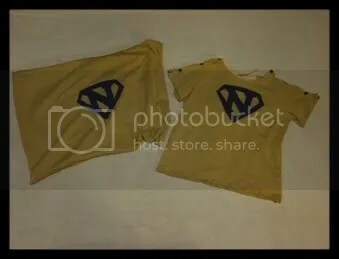 Then, using some purple cotton, I appliqued a letter N in the Superman crest across the final gown, to remind Noah of how tough he is!! I wanted to make sure he’d see this reminder of what a superhero he is, so I included a pillow case for him too. I can’t wait for his package to arrive! USPS is doing their best to be unimpressive, so a week later here I am, still waiting on delivery. AUGH! You can read more about sweet Noah at this blog: Pray for Baby Noah. He has had a rough road, and still has many obstacles to overcome, but he has come so far already! Please keep him in your thoughts. I found out a few weeks ago his mother has begun adapting children’s to be hospital friendly, as well as building her own from scratch. She is accepting donations of supplies and sewing time if anyone is interested in helping.